Have you ever thrown a party and nobody came? So, Wisdom is bending over backward to provide an abundant feast for us – all of us. Everyone is invited … but who is coming? Is anyone coming to this feast of Wisdom. The long-standing teaching of the Church has partaken of this feast of Wisdom, yet, many of her children have walked away from this feast of Wisdom. There is wisdom in the truth of how God has created us, His children. There is wisdom in the commandments that God has given us – they are not meant to restrict our freedom, or hamper our happiness. Quite the opposite: God’s commandments allow us greater and authentic freedom – They channel and direct our freedom in the right direction: Right praise and worship of God. Jesus Christ is the power of God and the Wisdom of God. Jesus not only lays out the feast, but is the feast. As we continue our study of the Sixth Chapter of John’s Gospel, we come to the climax of the Discourse on the Bread of Life. Recall, last week, we saw that Jesus discourse started by leading His followers to the conviction of belief: Belief that He has indeed come down from heaven. Now, in this second part of His Discourse, Jesus moves His focus from belief in His coming down from heaven – an absolutely necessary prerequisite – to eat of His flesh and blood. This week, we also see the reaction of the Jewish crowd to Jesus’ discourse. If we were to hear Jesus’ words in this Gospel for the first time, we would be able to sympathize with the Jewish crowd. But, Jewish teaching goes even deeper than simple physical revulsion. In book of Leviticus, it is taught that Jews are forbidden to partake of the blood of animals which they are eating. They believed that the life force of the animal resides in the blood. Some pagan cultures surrounding the Jews at the time did drink the blood of animals, thinking that the life force of that animal would enter into them. But God specifically directed His people not to behave the way the pagans did – and so the drinking of animal blood was prohibited. Now, Jesus directs His people that if they do not eat His flesh and drink His Blood, they will have no life within them. What was once prohibited in Jewish law concerning animals is now required with regard to the Flesh and Blood of God made Man. Jesus wants us to have His life within us. Furthermore, Scripture teaches that without the shedding of blood, there is no forgiveness of sin. (Hebrews 9:22) So the sacrifice of Jesus Christ and the shedding of His blood is the source of our forgiveness of our sins. But we must partake of that feast! 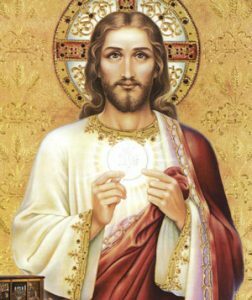 Unless we eat the flesh of the Son of Man and drink His Blood, we will have no life within us – We will be dead in our sins. So, let us take both parts of Jesus Bread of Life discourse and apply it to our lives: Do we truly believe that Jesus is Lord and has come down from heaven? If we do, then anything else in our lives that occupies a prominent place in our attentions and affections must give way to Jesus. After all, the word “worship” comes from an old English word that points to what is of highest worth or value to us. St. Paul knew that the conviction that Jesus is Lord was highly provocative in his day. It meant that if Jesus is Lord, then Caesar is not lord. In the same way, if Jesus is Lord of our lives, then we must rid ourselves of the “Caesars” in our lives – those things that take primacy in our hearts – and let the Lordship of Jesus Christ direct our affections and attentions. Let us then not leave Wisdom’s banquet unattended. Let us partake of God’s wisdom – through His commandments and through His Son Jesus Christ – and invite others to this feast, so that they may eat of God’s wisdom and live.